Many industrial processes rely on metal oxides with high surface areas. Especially magnesium oxide is a very promising candidate for various applications, for instance the oxidative coupling of methane. Most applications require a high surface area to maximize the number of accessible surface sites. This can be achieved by introducing small pores. But since catalytic reactants need to enter the porous systems very fast, pores should not be too small. Thus, mesoporous materials seem to be the best compromise between high surface area and fast mass transport. However, the synthesis of mesoporous materials with controlled pore size requires specific synthesis strategies. A micelle-templated synthesis seems to be a promising approach, but was not yet shown for magnesium or any other alkaline-earth metal. 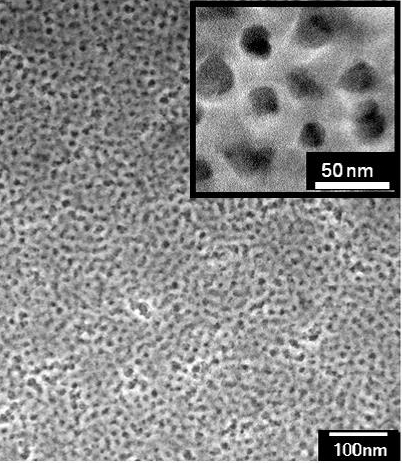 Scientists at the TU Berlin now developed a method for the synthesis of mesoporous nanocrystalline magnesium oxide and magnesium carbonate films via micelle-templating. It was shown that the contradiction between precursor melting and solubility could be overcome by developing an appropriate precursor complex and a template polymer, and so elucidate factors that are critical for the micelle-templated synthesis of mesoporous oxides of alkaline-earth metals in general. With this method, the fabrication of alkali and alkaline earth is possible, as well as the production of rare earth metal oxide films with high surface area.